This is a northern red-legged frog and he has been a regular at the pond where I found him for years. While there are many other frogs who call that pond home he is distinctive as he is missing a hind leg. It doesn't seem to affect his ability to swim, I saw him shoot across the pond after we finished our little portrait session. Red-legged frogs are an indigenous species and my friend Lory has two ponds in her backyard that are teaming with tadpoles right now. 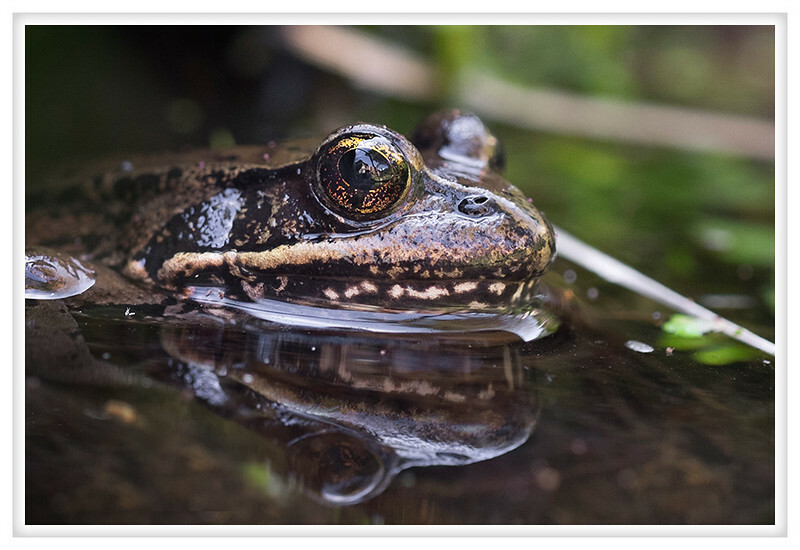 What's unusual is that these frog, while prolific, are not noisy at all because they make their calls underwater but their diminutive relatives, the Pacific tree frogs, are almost deafening with their loud persistent calls. Unfortunately their numbers are in decline and while they're still commonly found it is a cause for concern.